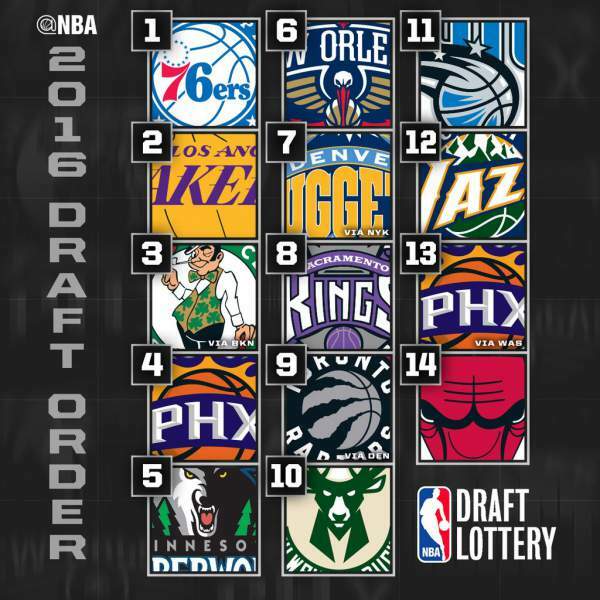 2016 #NBADraftLottery full results | 76ers win NBA draft lottery, Lakers will pick 2nd, Celtics 3rd - Balita Boss! The Philadelphia 76ers won the rights to the No. 1 overall pick in the 2016 NBA Draft Lottery, held Tuesday, May 17 in New York City. The Los Angeles Lakers landed the second pick, with the Boston Celtics drawing the third choice, the Phoenix Suns the fourth and the Minnesota Timberwolves the fifth. The Sixers now in position to make their third number one pick in team history. The last time they had the number one pick in 1996, they drafted Allen Iverson. In 1973, the first time they got the number one pick, they selected Doug Collins.